Bon Appétempt: Martha Stewart, This Wasn't Fair. Martha Stewart, This Wasn't Fair. 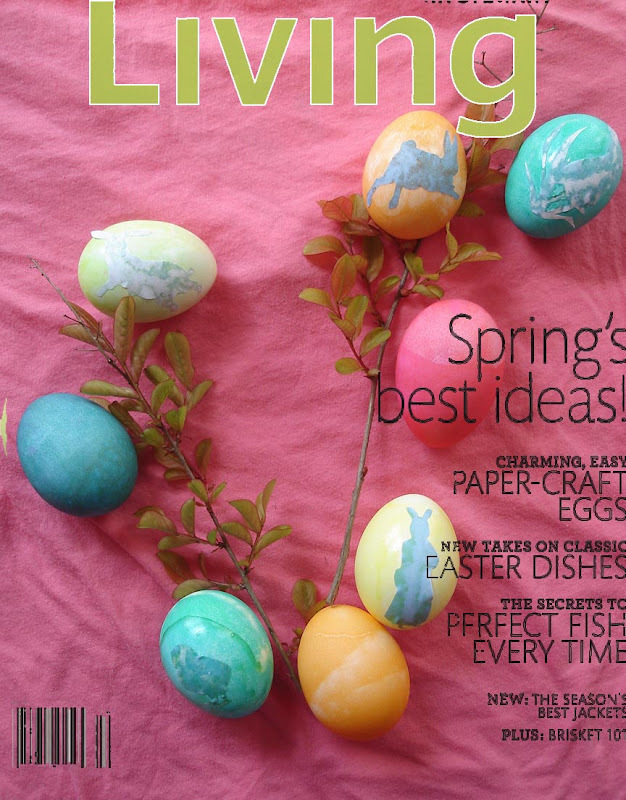 When I saw the below cover of Martha Stewart Living, it was love at first sight. I have to make those eggs, I thought. Things got much worse at the decoupage stage even though they started out looking only mildly unsuccessful. I wanted the white side of the paper to show, but the glue was causing the blue color to creep in. Eventually, we learned that the blue side needed to be face up if they were going to look like anything resembling Easter in the slightest. I think I'm going to need some time to heal before I attempt another Martha craft, but I think everyone at the Pesach/Easter party appreciated (or appreciated making fun of) my efforts. Martha is EVIL and a LIAR. There's no way she did her eggs according to her own instructions. Why doesn't she just reveal the REAL instructions, such as "spray paint your eggs pea green, idiots!" I boycott her. Someone should devote an entire blog to exposing the impossibility of all Martha's projects. I blew the innards out of eggs one Easter! They were pretty. And then one time I got really mad and smashed all my own blown-out eggs on my own bedroom floor. I don't remember why I did that. Love the last two photos. Bravo to you for even TRYING to make those eggs. I came across your blog as I am searching for egg ideas for this year! Very very funny! I am going to post my attempts tomorrow or the next day. . . I'll be trying her tape technique as described in this month's issue. I'll also be using my own tried and true gluing crystals to eggs technique!! And you are completely right: no dye job wil yield that green!! While I don't believe it is possible for any of us to achieve the same level of perfection that an entire army of helpers can achieve for Martha, you admit you didn't do things in any way the same as Martha. When you hard boil eggs you change the way the shell accepts the dye. When not boiled the egg shell stays more porous and the dye permeates deeper and you get a more deep color. I dyed the eggs several times and got a very nice matte green. Next time don't boil the eggs. Use a heavier paper for the cut outs - more like a card stock. And make sure your eggs are fully dry before you try to put the cut outs on - that's hard to do w/hard boiled eggs because they don't really ever dry out. Use a craft knife not scissors to cut out the shapes. Martha and her army used the ridiculously expensive craft punches which is why they look so perfect. You can find the punches for a lot less money at certain close out stores - Big Lot is one in our area that sells Martha Stewart stuff for CHEAP!!! Also some dollar store/party stores sell the stuff. Anyhoo - hope you have better luck w/some other of her craft ideas. Some of them are really fun! Right now I'm working on something called "eggcorns" - eggs w/little triangles of ribbon @ the top to make them look like acorns. Super fun! !